Ideal for Pre-Algebra, Algebra 1 & 2, Trigonometry, Statistics, Business & Finance, Biology and Physics. Includes USB cable for instant computer connectivity. Preloaded software, including the Cabri™ Jr geometry app. Student units connect by adapter to ViewScreen™ panel or TI-Presenter™ video interface. 480 KB FLASH ROM memory for data archive and storage of Apps. Link with another TI-84 Plus, TI-84 Plus Silver Edition, TI-83 Plus, TI-83 Plus Silver Edition or TI-83. Receive lists L1-L6 from TI-82. TI ViewScreen™ unit available (Silver Edition version only) that is compatible with the same TI ViewScreen™ LCD panel as the TI-82/TI-83 and the TI-Presenter™. 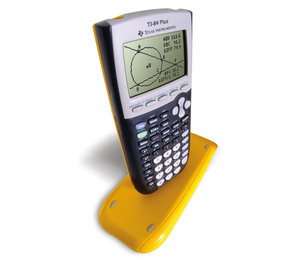 All TI-84 Plus student models can plug into the TI-Viewscreen™ LCD Panel and TI-Presenter™ with available adapter. Teacher Pack available (includes 10 TI handhelds, 1 guidebook, classroom poster). Connectivity: I/O port enables the exchange of data and programs with other TI calculators (unit-to-unit cable included). USB port enables connection to a PC for data and program exchange (USB included).